As the ticket inspector comes closer, you rummage in your bag and are positive you packed your bus ticket… and then come to realize you must have forgotten it after all. This can never happen again with our X2 implant. 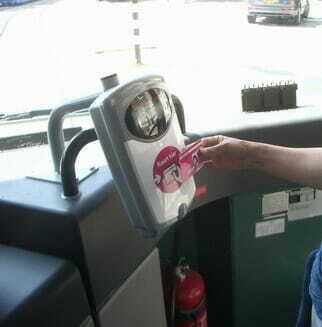 The NFC chip implant allows you to check in at the drivers booth and is valid with the ticket inspectors device. How do you transfer your ticket to an NFC chip implant? You don’t. This function is similar to replacing a membership card in a fitness studio. You can deposit your chips serial number with the responsible public transit department. The check in device only reviews the serial numbers entry access by registering your data code with the system. The serial number that the device uses to verify the chip is irrelevant, as long as the number matches the chip and data. According to reports by users this is already possible in the Rhineland area where the RMV is the public transportation. Please note that every public transportation department may choose to replace a monthly cards serial number with that of an NFC implant and also may choose not to.